Ooh, it’s all very exciting! 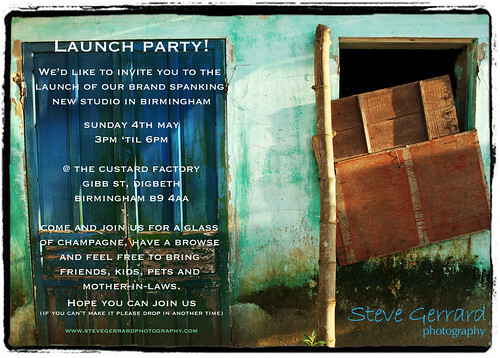 The official launch of our new studio for Steve Gerrard Photography happens on Sunday 4th May and we’ve just emailed out the invites, which you can see below. We’ve finished painting now and our lovely leather couch has been delivered. We’ve ordered a ton of great images for the walls which should arrive any day now. All that’s left is a sign for the front window, a bit more furniture and, most importantly, a kettle and a fridge!